Guests may attend this meeting, either with or without an APSG member. A fee for attendance is required. This meeting is included in membership fees for all current members. Please log-in to the website to register. Those speaking/presenting at this meeting are granted free entry. APSG 40, the organization's 2018 Fall Meeting, has been announced! This meeting will be held on Friday, November 9 at the Anadarko campus in The Woodlands, TX. 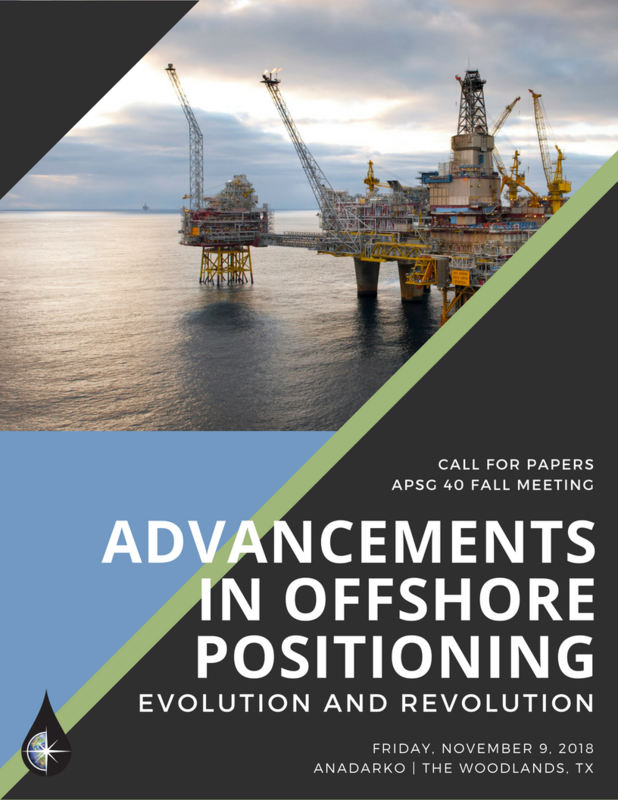 Our organization invites you to submerge yourself in Advancements in Offshore Positioning - Evolution and Revolution, exploring Offshore technology that is improving the effectiveness and efficiency of obtaining first oil and sustaining production as well as reducing operational risks and improving safety across the board. Download the event packet here. This meeting will feature a keynote presentation by Ed Saade, president of Fugro USA, as well as talks by APSG members throughout the day. 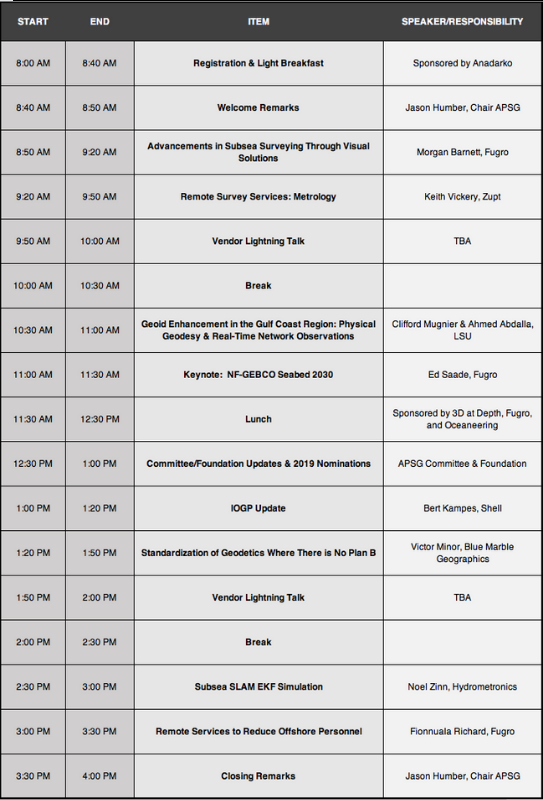 Please click on the image below to view the full agenda. If you and your company are interested in becoming a sponsor for the Fall meeting, please contact Melissa Wood or Greg Pilgrim at membership@apsg.info. We have several levels of sponsorships available - please ask about these as well as any new ways to highlight your company's capabilities and services! Please follow the signs for Allison Tower visitor's parking when entering the campus from Lake Robbins Dr. View a map of Anadarko's campus here. APSG will hold a social immediately following the meeting. Join us at Bar Louie, within walking distance from Anadarko.